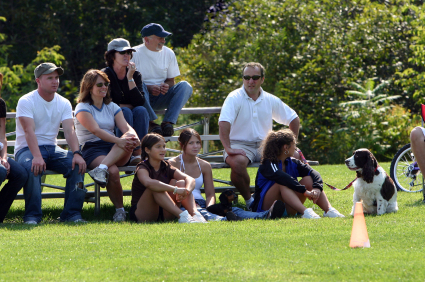 Are America's sports parents getting a bum rap? Earlier this year, a Reuters News/Ipsos poll caused a stir by concluding that parents in the United States are the world's worst behaved parents at children's sports contests. Sixty percent of adults who attend kids' games have seen parents verbally or physically abuse coaches or officials, a higher percentage than in any of the 21 other nations polled. "It's ironic," an Ipsos officer concluded, "that the United States, which prides itself in being the most civilized country in the world, has the largest group of adults having witnessed abusive behavior at children's sporting events." The poll seriously distorts the state of youth sports in America. Most parents may have seen the occasional disruptive adult, as I have. More than four decades of coaching, however, convince me that most parents and coaches practice civility while they teach sportsmanship, respect and integrity - and that most players learn these values. 5. With the opening match days away, varsity wrestler Reid Paswall  approached his Somers (N.Y.) High School athletic director to suggest that the captains for the opener be two classmates who were not even team members. The two captains, who have Down syndrome but yearned to participate in school sports, received a standing ovation and savored a lifelong athletic memory. 4. After winning the league title, the Billerica (Mass.) Floggers 14-15-year-old baseball team was set to receive $300 worth of individual trophies. The players voted to forego the trophies and donate the money instead to the local Little League Challenger Division, which provides baseball for youngsters with physical disabilities. "We've been really blessed to have a lot of talent . . . and the money will really help," said Flogger Max Frawley. 3. With his Allegany-Limestone (N.Y.) High School baseball team down by six runs, the coach went to the mound and instructed his pitcher, James Whitney, to hit the opposing batter with a pitch. Whitney refused, threw the ball to the ground, and sprinted to the dugout. James' mother supported his decision. So did the batter's mother, who called Whitney a "hero" for sparing her son, whose four prior concussions left him vulnerable to serious head injury. 2. Lewis Winter of Boca Raton, Fla. created the Safe At Home Baseball program for children of migrant farm workers in nearby Delray Beach. With donated equipment, the 15-year-old ballplayer enlisted a few former major leaguers to introduce the National Pastime to the underprivileged pre-teens, including some who now dream of big-league careers. 1. Chelmsford (Mass.) High School senior Rebecca Wong  finished tenth in the state high school alpine skiing championships, the final medal position. When she watched a video of her slalom run, however, she realized that she had missed a gate and should have been disqualified. Like Paswall, Whitney, Winter and the Floggers, Wong chose the high road. Rather than keep the medal, she e-mailed state officials to report her infraction because "I certainly cannot accept credit for something that I did not earn."